There’s no doubt that Sunday afternoon’s game at Belmore will go down in Bulldogs history and mythology as one of their best home fixtures of the last two decades. Not only was it the first time Newcastle had visited Belmore since 1996 (they last won there in 1992), but it was Josh Reynolds’ final game at his old stomping ground. With Greg Eastwood and James Graham still on the sidelines, and Brett Morris, David Klemmer and Josh Jackson at Blues camp, it was clear that the Dogs were going to have to pull something special out of the hat to send one of their most iconic players out in style, especially since they’d only won one of their last seven games. The fact that Reynolds was playing the Knights for his last Belmore fixture gave Sunday’s match an additional bittersweetness, with his ex-halves player apparently sending him a text message before the match dubbing it the “Battle of the Sixes.” For Bulldogs supporters, as well as Blues supporters, there’s always something especially galvanising about seeing Reyno and Hodko going up against each other in the halves, and on Sunday they brought out the best in each other, with Hodkinson putting down one of his very best games – and possibly his very best game – of the 2017 season. If all that weren’t enough to render this a memorable match, than the weather conditions were perfect for Belmore as well. At this time of year, it gets dark quickly, and the match was perfectly timed so that the oval was bathed in golden light for the first stanza, backed by a spectacular sunset at the beginning of the second stanza, and, finally, lit by a full moon for the last minutes of the game. Already one of the most porous NRL venues – the train line at the northern end never gets old – Belmore shines in this kind of rapidly shifting weather, and the beautiful conditions no doubt contributed to making this an iconic match. For a game that was somewhat historic for both sides, it felt appropriate that the first player to put down points had an affiliation with both teams. While he might have played 25 games for the Dogs, this fixture was the first time Kerrod Holland had taken on the Knights, making it particularly momentous when he put down the first try, as well as when he managed a difficult sideline conversion shortly after. 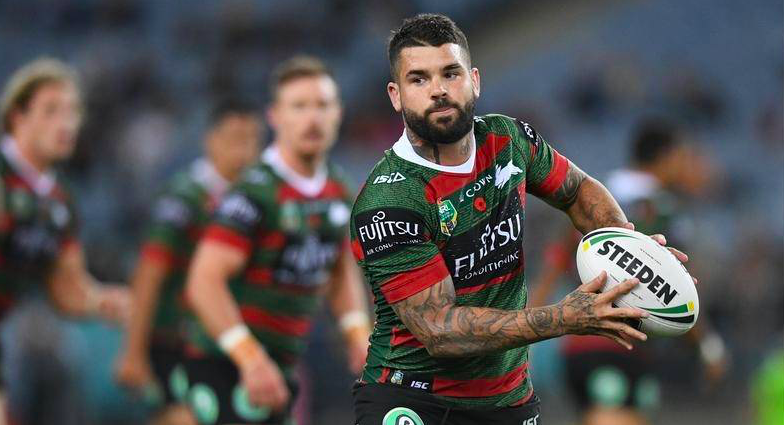 He came to Canterbury to get a shot at first grade footy, so there was something stirring about seeing him show his former NSW Cup team mates what he could do. The next ten minutes were a bit of a mixed bag for the Knights. On the one hand, they managed to put in two terrific trysaving tackles. The first came after a massive run down the right side of the field by Marcelo Montoya, followed by a run on the inside from Reynolds, who initially looked set to score himself, only to pop the ball over to Aiden Tolman at the eleventh hour. From there, the big prop’s speed and strength seemed destined to send him over, only for Nathan Ross to put in the tackle of the afternoon to bring Tolman to ground just short of the line. If Ross had struggled at fullback the week before, then this was proof positive that he’d approached his game with a new dedication this week, and you could tell that Tolman himself was surprised by being felled by this new conviction from the Newcastle no. 1. The second trysaving tackle was quicker, but even closer to the line, with Josh Morris initially having appeared to repeat Holland’s points in the left corner after having stormed through a low tackle from Brock Lamb, only for Bunker footage to reveal that a secondary tackle from Elliot had forced him to cough up possession right on the line. Yet it wasn’t just trysaving tackles, either bolstered the Knights’ confidence, with their wider defensive panache paying dividends about fifteen minutes in, off the back of one of the most dazzling attacking efforts from the Dogs so far. After a superb offload from Sam Kasiano – an offload that still looked like a stealth move in slow motion – Moses Mbye wove his way up the middle of the field, dodging and eluding several tackles with some of his best footwork in weeks, and getting his team up the other end of the field only for Chanel Mata’utia to force a knock-on from Kasiano on the third tackle. From there, the Knights regained possession and got a penalty to boot, only for Lamb to cough up a short ball from Hodkinson just as Newcastle were starting to consolidate their field position – one of several discipline and focus issues from the Knights that prevented their sterling defence ever quite giving them the upper hand in the opening half hour of the game. As the second stanza drew to a close, the Knights received a succession of goal line dropouts, the first of which came off a nice grubber from Lamb, which should by all accounts have resulted in points for Newcastle, only for it to bounce off Holland straight into Hopoate’s hands, before the Bulldogs fullback found himself tackled into touch by the Knights defence. Still, the visitors got six again, and then again at the end of the second set, with Frawley making one of the most unfortunate decisions of the game on the subsequent set, when he held Peter Mata’utia too long in the tackle with less than a minute left on the clock. Not surpisingly, the Knights got a penalty, but what was surprising was how quickly Mata’utia acted on it, glimpsing that he was in the perfect situation for a quick tap – at the head of the pack, just out from the ten – and pivoting off his right foot to elude both Hopoate and Saunders right at the line. Earlier in the game, the Dogs had chosen to attack the line instead of take a penalty goal, and now the Knights followed suit, with not even a late low tackle from Frank Tualau able to prevent Mata’utia crashing over. In fact, Hoppa managed to get him to ground, but Mata’utia compounded his speed, vision and footwork with some superb ball handling here, keeping the Steeden close to his chest and actually using the Bulldogs fullback as a fulcrum to keep himself stable before getting the ball to earth. In the dynamic contrast between the length of Frawley’s tackle and the speed of Mata’utia’s run, it was the perfect way for the Knights to conclude the opening stanza, showcasing exactly the panache and chutzpah that have become so critical to them rebuilding a sense of team spirit in their long journey back from the 2016 season. It was great spectacle as well, with Mata’utia almost appearing to have been recharged and renewed over the course of Frawley’s tackle, and with Hodkinson adding the extras on the siren, as the Knights went into the break with their heads held high, while the Dogs had even more pressure on them to bring home something special for Reynolds’ last game at Belmore. After such an incredible finish, it was perhaps inevitable that Newcastle would own the momentum for the beginning of the second stanza, with Hodkinson clocking up a penalty goal at the forty-ninth minute, and Chanel Mata’utia then adding to his brother’s try with a four-pointer shortly after. It started with what initially looked to be a trymaking play for the Dogs – a barnstorming run at the Newcastle line from Chase Stanley, followed by a deft offload that would almost certainly have put down points if Saunders hadn’t coughed it up, and left it open for Ross to dash in and intercept it. For a minute there, it looked as if the Newcastle fullback was about to break through the line and run the length of the field, and while he may have been brought to ground the Knights got down the other end soon enough, after getting a penalty early in the tackle count. From there, they put in arguably their most determined set of the night, as if aware that their time had come to take control of the game. Each player did their part, with Danny Levi burrowing into the defence and almost making it over the line, only for the the Bulldogs to put in an outstanding, scrambling pack defence and force the Knights back on some longer-range options. Fresh off his penalty goal, Hodkinson provided the requisite vision, putting in the best single pass of the night to Ross, and probably the widest – a long, looping, diagonal ball that flew across the chest of Reynolds for good measure, before Ross caught it and mirrored it with a similarly wide pass out to Mata’utia. All the Newcastle winger had to do was to catch and ground the ball, and while he may have slipped on the dewy grass, the passes from Hodkinson and Ross were so perfectly timed that he still had plenty of space to get the Steeden to turf. There had been an air of freakish brilliance to Peter Mata’utia’s four points, so it was great to see the Knights put down a try off sheer professionalism, while it must have been especially galvanising for the team to see Hodkinson firing on all fronts, since while he may be a relatively recent fixture at Newcastle, he’s become something of a rousing presence in the team, and a litmus test for their health and motivation. This was easily his best display of leadership all year, and you could tell the team really felt it, rallying around him as the second stanza reached its midway point. If the Knights were on a runner’s high, then things just got better when Peter Mata’utia crossed once again a couple of minutes later. Chanel’s try had placed Newcastle in front for the first time in the game, and his brother now doubled the Bulldogs score for his first career double, with Hodkinson’s conversion bringing the visitors to a ten point lead. Once again, the four points came off Hodkinson’s try assist (since his pass to Ross last time was effectively Chanel’s try assist), as the ex-Bulldog sent through a grubber at the end of a damaging set that was as perfectly and elegantly weighted as could be imagined. Eluding Montoya, Faitala-Mariner, Stanley and even Reynolds himself, the Steeden threaded and skidded through the Dogs defence with the confidence of a kicker who’d played for the opposition, as Mata’utia leapt forward to ground the ball almost as dexterously as Hodkinson had booted it, getting the slightest of downward pressures before tumbling forward over it and crashing into touch. In a game that was so focused on the Bulldogs family – and the Belmore family – there was something powerful about seeing three tries put down by a single Knights family. Similarly, the fact that Hodkinson had clearly outplayed Reynolds by this point in the game brought an additional urgency to the Bulldogs game, as the clock wound down and they faced the unenviable prospect of having to come up with two converted tries – at least – in the final ten minutes. The first part of the Bulldogs comeback started with nine minutes to go, when Reynolds alerted Ben Cummins that the ball had come off Peter Mata’utia in the midst of a messy bit of play that could have gone either way. Sure enough, the Dogs got the ball back, only for Joe Wardle to put in a massive tackle on Frawley just as he was about to pass, forcing him to cough up the Steeden early in the tackle count. Still, this sequence started a renewed period of focus and discipline for Reynolds, who put in his best minutes of the game from hereon out, and especially in the following six, a balls-or-all set from Canterbury-Bankstown that may not have resulted in immediate points, but whose determination and drive arguably provided them with the energy needed to win the game. It was bookended by a pair of offloads from Reynolds – one to Asipeli Fine, one to Stanley – but had its fair share of contributions from other players, including a split-second offload from Josh Morris to Holland early in the tackle count followed by an even more incredible offload from Holland to Hopoate, with the winger flipping the ball backwards over his head as he was driven over the sideline. As it turned out, that offload saved the Dogs’ game, with the Steeden now making its way rapidly across to the other side of the field and through a couple more tackles, before Frawley grubbered it forward, Lamb and Wardle desperately got a hand to it, and the Dogs received a goal line dropout. Reynolds opened the next set just as impressively, with a cut-out pass to Hopoate that proved instrumental for his fullback in getting the ball across to Montoya in turn, who sped up the sideline and leapt forward to land, ball-first, in the right corner, before Peter Mata’utia crashed him into touch. While the ball might have left Hopoate’s hands lass, the try assist belonged to Reynolds in spirit much as it had belonged to Hodkinson for Chanel Mata’utia’s four-pointer, and with Holland managing a tricky sideline conversion from the opposite side of the field from his opening two points, it felt as if the Dogs’ second try was symmetrical in more ways than one. A huge tackle from Peter Mata’utia on Stanley midway through the next set threatened to disperse the Dogs momentum, especially since Ross responded to the hosts’ fifth tackle option with an amazing catch under the high ball, as he showcased an utter assurance at fullback that demonsttrated how much he’d revised his strategy in the no. 1 jersey since the week before. Still, the play of the night came at the end of the subsequent Newcastle set, when Mbye put himself in position to thwart Lamb’s fifth-tackle kick, before scooping it up and running the length of the field to ground it beneath the posts. Any suggestion of a lucky break was quelled by the slow-motion footage, which showed just how dexterously Mbye had engaged with the Newcastle five-eighth’s kick plan, before burning down the field for the most joyous moment at Belmore in years. Indeed, so far ahead of the Knights was Mbye that the secondary Bulldogs runs became a spectacle in themselves, with Holland raising his hand over his head to remind his halfback to ground the Steeden close to the posts, and Reynolds speeding up in support with such a look of exuberance on his face that you could have been forgive for thinking that he was carrying the ball to the try line himself. Lining up the tee, Holland got the ball through the post and the party started, with the Dogs starting to seep into the crowd, and the crowd starting to flow over the sides of the field, with ten seconds still to go on the clock. If it was hard to rein Canterbury back into the game in these final minutes, they returned to the moment with a rude shock when what appeared to be an inadvertent shoulder charge from Reynolds granted the Knights a penalty right on the siren. Choosing to go for goal, Lamb had a shot at bringing the game to golden point, but in his efforts to orchestrate such a long range kick he hooked the ball too soon, sending it careening over to the left of the posts as the Bulldogs renewed their celebrations, after what had been the most suspenseful moment in their season to date. 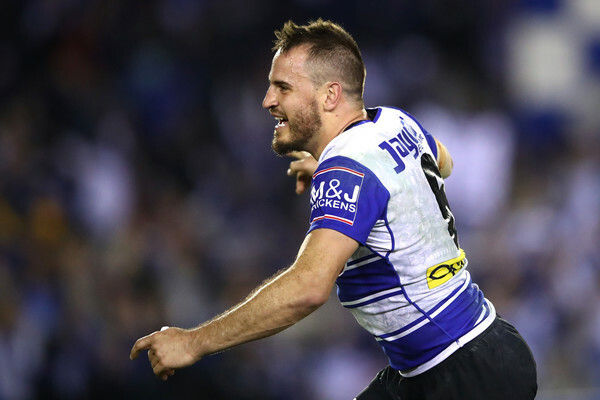 Yet that suspense, and buildup, also made the game feel especially true to Reynolds’ time at Belmore, since he’s always personified Canterbury-Bankstown a hard knocks team, a spirited team, and, above a team that can deal with its shifting fortunes with good humour. To see the Dogs come back from an 18-8 scoreline, and then come back once again from this final threat, made the game feel even more like Reynolds’ game, and there’s no doubt it will stay in the hearts and minds of the Belmore faithful for years and decades to come.